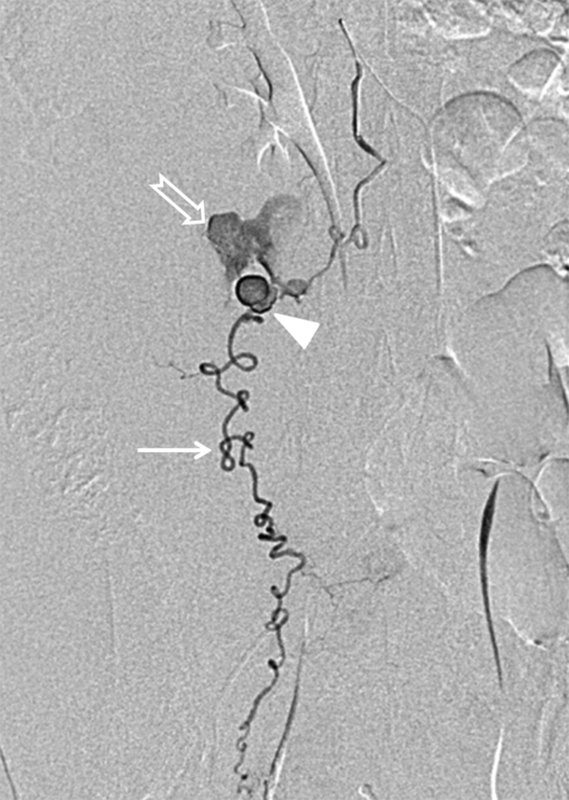 To Cite: Hyun Kwon J. Percutaneous Transarterial Embolization of Spontaneously Ruptured Ovarian Artery Aneurysm Using N-Butyl Cyanoacrylate, Iran J Radiol. 2014 ; 11(3):e13371. doi: 10.5812/iranjradiol.13371. Figure 1. A 52-year-old post-menopausal woman with acute abdominal pain in the right lower quadrant. A) Arterial phase contrast-enhanced axial MDCT image shows an enhancing round aneurysm (small arrow) in the retroperitoneal hematoma (long arrow) B) Coronal MDCT image shows a tortuous right ovarian artery (small arrow) and aneurysm (empty arrow) located in the retroperitoneal hematoma (long arrow). Figure 2. 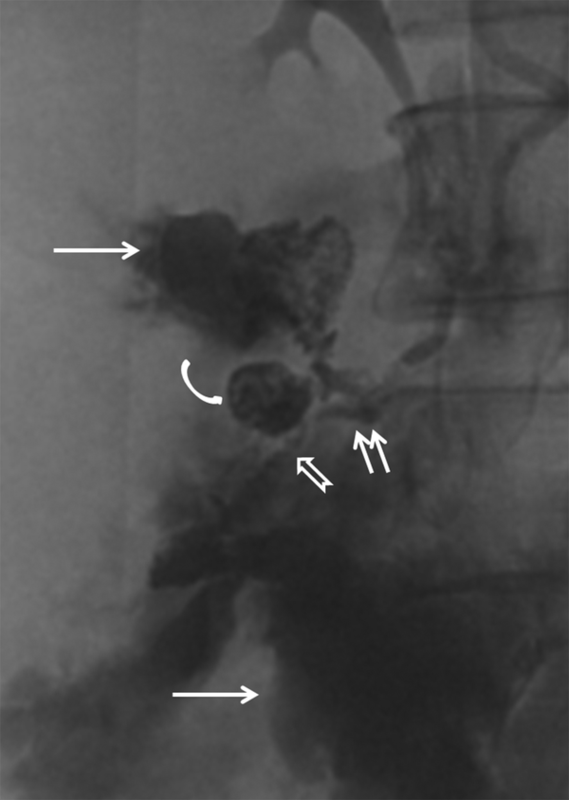 Selective right ovarian artery (arrow) angiogram shows active contrast extravasation (empty arrow) from the right ovarian artery aneurysm (arrow head) in the same patient. Figure 3. Spot image after embolization shows distribution of the glue located in the right ovarian artery in the same patient. The glue and lipiodol mixtures are located proximal (short arrows) and distal (empty arrow) to the ovarian artery aneurysm (curved arrow). Note the large amount of extravasated contrast media (long arrows) around the ovarian artery and the aneurysm during angiography and transcatheter embolization.